The modern toothbrush, which first appeared around 1938, is one of the simplest yet most effective tools you can find to clean your teeth. And no matter how technologically savvy we’ve become over the 80 years of its existence, it still remains a necessity in our oral hygiene routines. It does come in different variations, though. 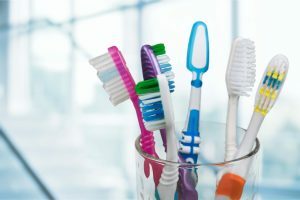 One choice you have when making a selection is whether to get a model with soft or firmer bristles, leaving you wondering, “Which is better?” Your dentist of Keller will answer that question and more as you continue reading. One of the mistakes that is commonly made is to view the brushing of one’s teeth like cleaning a dirty pan that has the remnants of a sauce hardened on its surface, requiring an abrasive pad and some elbow grease to remove. The mindset here is to use whatever will get the job done. A sensitive structure – The outer layer of your teeth called the enamel, although very strong, is still very sensitive. Thus, it can’t be scrubbed vigorously with harsh abrasives like a pan. Irreplaceable – Another fact to remember is that your enamel is not replaceable. Once it’s damaged your body can’t grow a new layer. Consequences – When damage occurs to your enamel, there are consequences, one being that your teeth will become more sensitive to the hot and cold temperatures of your environment and the foods and drinks that you consume. What’s Better – Soft or Firm Bristles? Are your gums prone to bleed easily? Have you been diagnosed with gum disease? Do you have damage to your enamel? If the answer is yes to either of the above questions, then it’s even more important that you use a toothbrush with softer bristles. You’ll still be able to remove a sufficient amount of plaque without irritating your teeth and gums. Even if you don’t have any of these problems, most professionals agree that a firm brush is never necessary to clean your teeth. It’s best to either choose an extra soft or soft bristled option. Hold the brush at a 45-degree angle when cleaning the outer layer. When cleaning the inside of your teeth, use gentle vertical strokes. For the chewing surfaces, use gentle strokes that move from back to front. These methods will ensure that your teeth will be cleaned without enduring any unnecessary damage. So now you’re more informed and ready to attack bacteria and plaque with the aid of your trusty toothbrush, a simple yet highly effective tool. And if you have any other questions about your oral hygiene just reach out to your family dentist of Keller today. Dr. Shweta Sinha received her degree in Dental Surgery from India and then went on to continue her studies at Herman Ostrow School of Dentistry, where she obtained her dental degree. She practices at Smile Refined Family Dentistry and can be reached for more information through her website.